The Sony Cyber-shot DSC-TX5 is Sony’s first water- and dust-proof, ‘drop-tough’ and freeze-proof camera. Olympus and Canon have done well with their ‘go anywhere’ digicams, so Sony naturally saw a market opportunity with theTX5, able to descend to three metres underwater, dust-proof, ‘droppable’ from a height of 1.5 metres and capable of withstanding a temp of -10 degrees Celsius. As the company says, it is “tougher than it looks” with a stylish gloss and satin duo finish available in silver, black, pink or red. 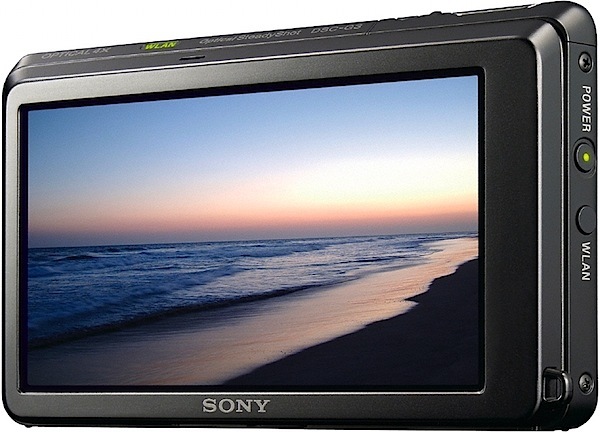 It is unusual in that it uses a back-illuminated Exmor R CMOS sensor Sony says it lowers image noise by half. We’ll see! At first glance, the package is impressive: the camera is thin, only 17.7mm; the sliding door arrangement is terrific, easily slid open to kick on the power — just what you need when underwater or crashing through the jungle. Zooming is achieved by waggling a small but prominent lever right next to the shutter button. Menu choices can be made by tapping on the 7.6cm screen and, even with gloved fingers, the system still works. Maximum image size is 3648×2736 pixels, sufficient to make a 31x23cm print. Movies? Up to 1280×720 pixels at 30fps, which is sort of OK but wouldn’t it have been great if Sony had given this little whizzer the ability to shoot the Full HD res of 1920×1080 pixels? Wouldn’t it? As it is, the TX5 possesses the same panoramic genius that the earlier DSC-HX5V camera does, namely, the iSweep function that lets you shoot enormous panoramas with the camera held vertically or horizontally. And … a 10 fps burst speed at full resolution! Imagine: 243 degree, stitched in-camera panos and continuous shooting underwater! The lens is a Carl Zeiss Vario-Tessar 4x optic, but … my caveat against all the current underwater digicams is that the widest focal length (25mm 35 SLR equivalent above ground), when submerged, becomes a 35mm lens, due to refraction. The point of this is that, underwater, the closer you are to the subject the better able you can avoid picture degrading water turbidity. HDR: I’m not sure whether this feature would be useful when underwater (unless the camera is tethered to a fixed point) but, above ground, it is a handy thing to be able to shoot a pair of images with differing exposures and processed as a single High Dynamic Range picture as the TX5 can do. At ISO 125, a good, well-resolved image, no noise. At ISO 800 resolution is still OK and noise is well down. A useable setting. At ISO 1600 noise is now visible but definition is still acceptable. An OK setting for some subjects, like low light etc. At ISO 3200 noise is well up, but definition is surprisingly good — useable in the right shot. The back-illuminated Exmor R CMOS sensor is obviously doing its job. No sign of any distortion at the wide or tele ends of the zoom. From power on to first shot took 2-3 seconds, follow-on shots came in as fast as I could hit the button. Quality: I found the TX5 took above average quality pictures for a compact digicam, although it was subject to flare, due to the lens being so exposed. Take my advice and use the upper ISO settings to attain the fast shutter speeds. Why you would buy it: you want to easily shoot underwater, capture panoramas, shoot a burst of frames. Why you wouldn’t: you already have Olympus or Canon’s u/w model! One tip: make yourself very familiar with practice runs on the viewfinder menu before you head out to shoot. Otherwise, welcome to another rugged digicam! Image Sensor: 10.2 million effective pixels. Metering: Multi zones, centre-weighted, spot. Lens: Carl Zeiss Vario-Tessar f3.5-4.6/4.43-17.7mm (25-100mm as 35 SLR equivalent). Shutter Speed: 2 to 1/1600 second. Memory: Memory Stick PRO Duo/PRO-HG Duo/SD/SDHC cards plus 45MB internal memory. Image Sizes (pixels): 3648×2736, 3648×2056, 2592×1944, 1920×1080, 640×480. Movies (pixels): 1280×720, 640×480 at 30 fps. Rear LCD Screen: 7.6cm LCD (230,000 pixels). ISO Sensitivity: Auto, 125 to 3200. Interface: USB 2.0, AV, DC. Weight: 144 g (with battery and card). Price: Get a price on the Sony Cyber-shot DSC-TX5 at Amazon. Same thing with me, my TX5 stopped working and Sony wants $658 to fix it. I paid $349.00 for it btw. I am not buying Sony at this point. I'm totally disapointed with Sony because of this camera. I have just used it for 2 weeks then it died. First time using the camera under water, after few minutes, it stopped working, the screem got crazy and it never turn on again. I have burned 300 bucks on nothing! I have followed all procedures, stayed in a place with less than 2 meters deep, only about 15 minutes after, the camera sttoped and never work anymore. I'm an old user of Olympus Stillus camera, and I love that, it still working for more than 4 years. I'm in Brazil, so I expent U$40 to send the camera to the repair center and guess what, to fix the camera they charged me U$ 576!!!!! It's under warranty, I just used the camera as the specifications described in the manual and it get stuck, do not work anymore. That's the worst product I ever have with the worst support. My equipment still at Laredo Repair Center, I hope sony can solve this problem ASAP!!!! The support is awfull, customer suport and Laredo is even worst. I have wrotten a letter describing the problem, how it was used, everything in details and it looks like nobody read it. They just put the status at internet, to fix, it custs U$576!!!!! Call support to approve it. I have paid U$270 in the camera, its more than twice to get it fixed!! I called them and they told me many technical stuff and that simply the camera cannot be fixed. I have asked for a formal email about the problem and what cause it and they cannot send it!!!! Its awfull, please do not buy this unit, when you look at it, its beatyfull, looks like a good device, however, its totally disapointing, only if you need to burn 300 bucks, its better if you get a ligther and burn it, less headache you have. I recently bought this camera and I'm very satisfied. Before this one I had Olympus MJU 1030 SW. If I compare it to Sony, Sony have way better image quality. iSweep and HDR functions are great. The only complain I have is about the way how you connect camera to TV or computer. For that you have to open battery doors, and then connector doors, to connect to external device. In this time you can't close battery doors. It's a minor inconvenience, but if you not careful you can break battery doors. All in all this is a great camera! I own an Sony Cyber-shot camera (DSC-W series) for few years. Made great photos with it. It would have been great if you had included an image of the rear view of the camera also. Sony cameras have good lenses, Carl Zeiss, my DSC W55 has been in used since 4 years ago. It has been accidentally dropped by my grandson two or three times but still in good shape and working.